Dickens County Spring Park, Dickens Springs, Dickens Texas. At one time, water covered this area. Sandstone, the prominent rock around this site, is porous, causing exposed strata at canyon rims to form a natural drainage outlet for upland aquifers, making possible the existence of these springs. Situated at the head of a canyon ravine immediately below the Upper Prairie Region of the Rolling Plains, the ancient springs have been a favored human habitat since the earliest human occupation in this region. Many nomadic tribes have used the site, leaving behind a wealth of archeological evidence. 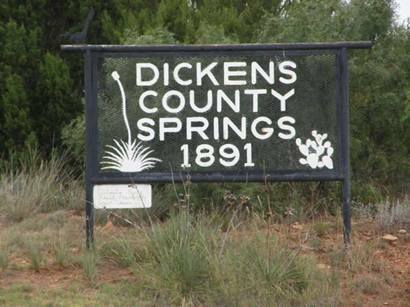 John A. Askins and his family settled near these springs in late 1883, and it became known to pioneers as Askins Springs. A traveling real estate developer called Dr. M. S. Crow arrived here in 1891 and was a driving force in the organization of the town of Dickens about a half-mile west of the Askins land. In 1891 he gave a speech proclaiming his intent to give ten acres around "Crow Springs," as he called them, to the town of Dickens. The new city park became known as Dickens Springs. 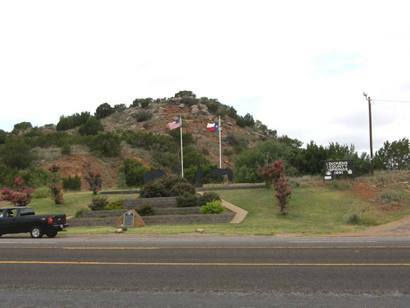 Generations of Dickens citizens and tourists, attracted by the rugged and colorful scenery and the unique collection of plants, have visited this site for picnics and social gatherings. 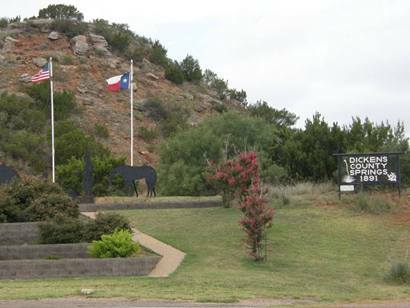 In 1978 the departments of Anthropology and of Park Management at Texas Tech University made an intensive survey of the land surrounding Dickens Springs. Though many artifacts were lost to souvenir hunters, the university workers uncovered a variety of ancient tools, rarely of local origin. 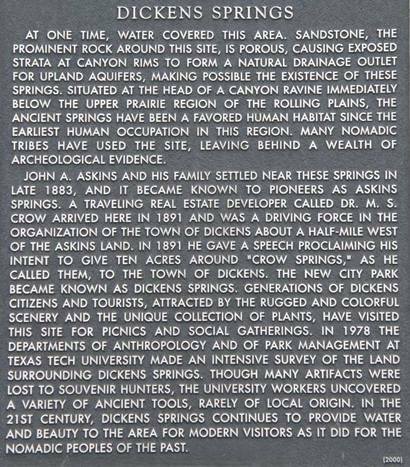 In the 21st century, Dickens Springs continues to provide water and beauty to the area for modern visitors as it did for the nomadic peoples of the past.